Well it is Monday again and you know what that means; Mojo Monday Sketch Challenge! 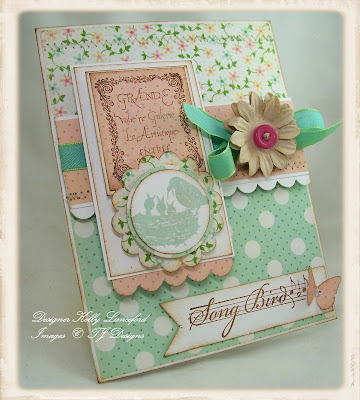 I took the weekend off from stamping so it felt good to sit down and make a card. My desk and surrounding floor is an absolute mess, but sometimes I find creativity in the mess! 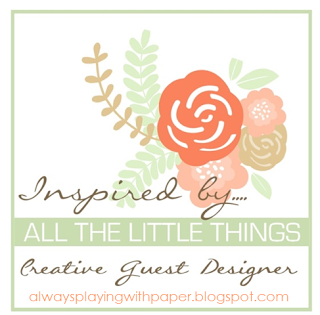 I love having things neat and orderly, but the messier things get in the creative process, the more the ideas flow! At least that is how it is for me! If I already have an idea, then I need things to be tidy. I headed over to the MojoMondayblog to see this week's sketch! It is a fun one! I knew I wanted to use this new paper I got over the weekend called "Flower Patch" from Making Memories. My Mom and I stopped at my favorite Scrapbook Store after the bridal shower and I went crazy on ribbon! I did pick up some envelopes, paper and Kaiser flowers, too, but the majority was luscious ribbon! After I got the base of the card ready, I needed some stamps. 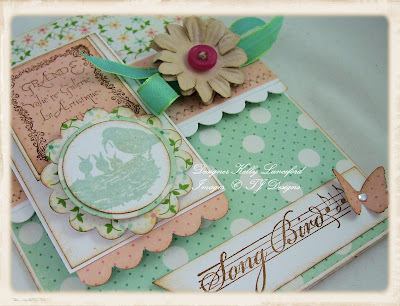 I couldn't decide right away, but settled on using theSongbirds stamp set from TJ Designs, a division of TweetyJillPublications. I have been so fortunate over the years to have many of my projects featured in her Idea Books. 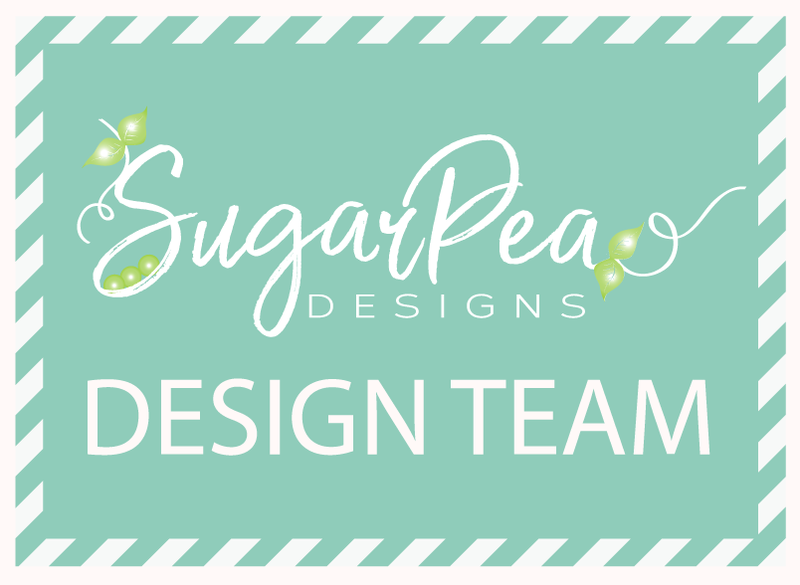 Over Christmas I was feverishly working on quite a few new designs that will be featured in her upcoming releases! I will be so excited to see them in print~! I put my heart and soul into them! This card will be going in my stash that I have set aside to surprise someone with! Thanks for fluttering by! P.S. 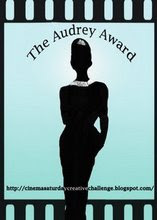 Did you see my Audrey Award on my sidebar! How fun is that? Also, if you would like to subscribe to my blog, you can click on the feedblitz counter on the side. I had some technical difficulties over the weekend and had to delete my other widget. This is stunning! Wow! You did a wonderful job! What a unique color combo! I love how you worked this sketch out. I know what you mean about the creative process and the mess. Good thing it works that way sometimes! wow, what a wonderful card, i love it. Wow! THis card is gorgeous! Love love love the colrs, nice job! Holy cow, this is GORGEOUS!!! I just got this same paper pack!! Beautiful patterns!! You details are amazing, Kelly! Fabulous like always!! Lovely work and details! This is so gorgeous! It's no wonder TweetyJill would want you in their books! I love the sweet shabby look. Love the soft vintage look of this card. Beautiful! Gorgeous! Those stamps are wonderfully shabby! Love all the elements together! This is stunning, Kelly! I love it! Ok first I need to pick my jaw up off the floor! Seriously Kelly, this card is GORGEOUS! 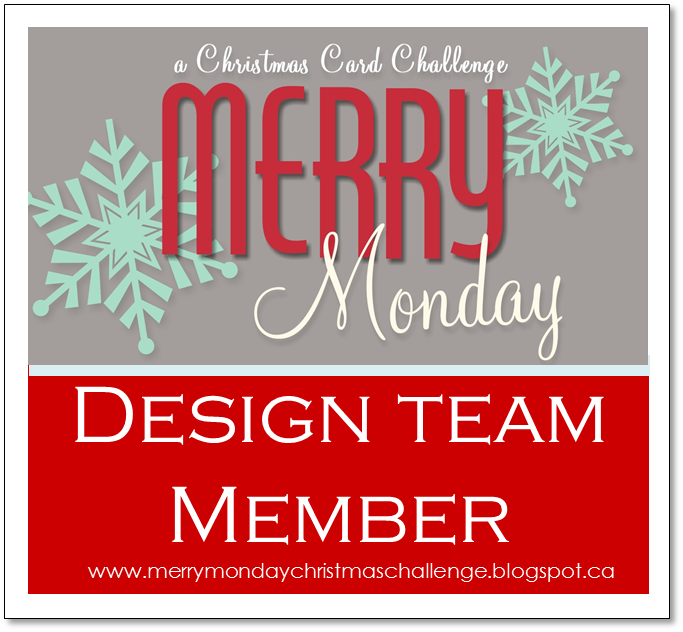 I absolutely love the softness and warmth this card gives off! It couldn't be more perfect! This is striking! great job with this sketch! WOW! This is just jaw dropping gorgeous! I bought this paper yesterday, but I know it will be hard to cut into for a while! LOL! Wow! your work amazes me...those layers and elements are beautiful! Kelly, this is such a stunning card! Love all the details! This is a STUNNER!! 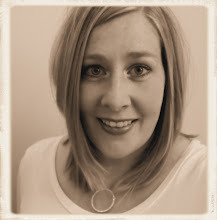 I am so glad you got your blog working right...what a headache that had to have been!! Be still my heart! This is so sweet and shabby chic! LOVE it! This is beautiful!!! I love the colors and details! Oh my goodness Kelly! 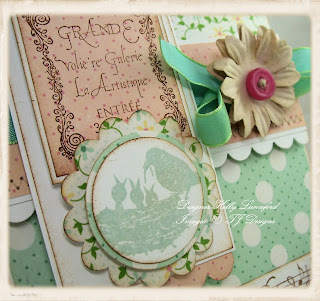 These vintagey, shabby chic cards just take my breath away. I don't even know where to start. You have such a talent and I'm just in awe. Ditto to what everyone said and more!! Just so oh my goodness beautiful! Very pretty card! I think the button adds just the right splash of color - perfect! So very gorgeous Kelly! Love all of the prints, colors and charm! This card is stunning! The colors are so fresh they make me ready for spring! Wow, I am so glad to have found your blog. I stumbled over from Suzanna Boyd's Card of the Week and I am so impressed. going now to add you to my google reader. You totally Rock... What a beautiful card! I has so much to look at all the detail is amazing... I usually forget about my soft and subtle family's with the exception of a few colors but holy moly... This card just sings... I want to create one for myself... Thanks for sharing.. Cant wait to see another amazing creation from you! What a beautiful card. I love the soft, vintage look. TFS! Love this card.... the colors, the patterns, the bird theme... yummy! Kelly, this s just gorgeous!! love the colors and all of the pretty details! Oh what a pretty card! Love all your details, and those gorgeous colors! Showers of Love & a give away!